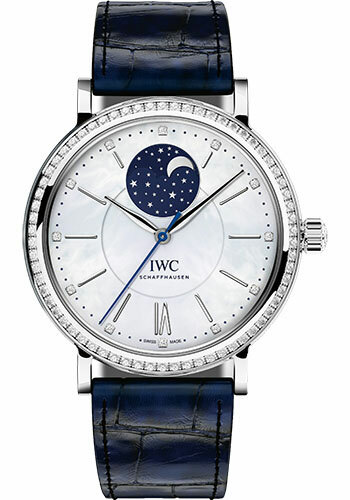 37 mm stainless steel case set with 66 diamonds, 11 mm thick, diamond bezel, convex sapphire crystal with antireflective coating on both sides, mother-of-pearl dial set with 12 diamonds, calibre 35800 automatic movement with moon phase display and central hacking seconds, approximately 42 hours of power reserve, dark blue alligator leather strap, pin buckle. Water resistant to 3 bar. 37 mm 18K red gold case set with 66 diamonds, 11 mm thick, diamond bezel, convex sapphire crystal with antireflective coating on both sides, mother-of-pearl dial set with 12 diamonds, calibre 35800 automatic movement with moon phase display and central hacking seconds, approximately 42 hours of power reserve, black alligator leather strap, pin buckle. Water resistant to 3 bar. 37 mm 18K red gold case set with 66 diamonds, 11 mm thick, diamond bezel, convex sapphire crystal with antireflective coating on both sides, mother-of-pearl dial set with 12 diamonds, calibre 35800 self-winding movement with moon phase display and central hacking seconds, approximately 42 hours of power reserve, dark brown alligator leather strap, pin buckle. Water resistant to 3 bar. 37 mm 18K white gold case set with 90 diamonds, 11 mm thick, diamond bezel, convex sapphire crystal with antireflective coating on both sides, black dial set with 84 diamonds, calibre 35800 self-winding movement with moon phase display and central hacking seconds, approximately 42 hours of power reserve, black alligator leather strap, pin buckle. Water resistant to 3 bar. 37 mm 18K red gold case set with 66 diamonds, 11 mm thick, diamond bezel, convex sapphire crystal with antireflective coating on both sides, mother-of-pearl dial set with 12 diamonds, calibre 35800 self-winding movement with moon phase display and central hacking seconds, approximately 42 hours of power reserve, 18K red gold bracelet with milanaise mesh. Water resistant to 3 bar.